WINNIPEG - Andrew Harris accomplished something he had never done before in his professional career on Thursday. The Blue Bombers running back chalked up more than 100 yards in both rushing and receiving as Winnipeg won its fourth straight game and handed the Edmonton Eskimos their first loss of the season with a 33-26 victory. "Probably not since junior. Probably not even junior,'' the 30-year-old Winnipeg native said of the double century marks. Harris rushed 11 times for 105 yards and had eight receptions for 120 yards in front of 30,554 fans at Investors Group Field that gave their team a standing ovation as time wound down. Nichols matched a career-high by throwing for 390 yards as he completed 32-of-40 pass attempts with one touchdown and no interceptions. He also ran in a one-yard TD. "Guys were out there making plays ... breaking tackles and ripping off 15 yards,'' Nichols said. "It seemed like every time I'm standing back there I'm watching Andrew running down the field, breaking tackles,'' Nichols said. It was Winnipeg's second win against a CFL West Division opponent. It gave the team 12 points and second place in the division, but Calgary (11 points) plays B.C. Friday. Quarterback Mike Reilly was 20-of-33 for 356 yards with two TDs and one interception. "When you're playing against an opponent like that, you need to play four quarters of good football and we played two quarters of pretty good football,'' Reilly said. Winnipeg (6-2) led 3-0 after the first quarter and 17-3 at halftime, the fewest points Edmonton (7-1) has scored in the first half this season. It was 27-17 for the Bombers after the third quarter, but the Eskimos started to squeeze the score. Bombers kicker Justin Medlock missed a 51-yard field-goal attempt early in the fourth quarter that Edmonton ran out. A 72-yard catch-and-run by Cory Watson then helped set up a one-yard TD plunge by Reilly at 8:48. After Hugh O'Neill went wide on a convert attempt, the Bombers were only up 30-23. Medlock got another chance and booted a 32-yarder with 1:22 left. Bombers lineback Maurice Leggett then intercepted Reilly, but Winnipeg was called for illegal contact and it was wiped out. A challenge was unsuccessful. The Eskimos pushed deep into Winnipeg territory, but the drive ended with O'Neill's 16-yard field goal with 14 seconds left and the score 33-26. Bombers receiver Darvin Adams sealed the win when he grabbed Edmonton's onside kick two seconds later. Eskimos head coach Jason Maas had at least four more players go down with injuries to add to the 20 already on the injured list. Maas said Harris is hard to stop. "We just didn't make enough plays tonight, and it didn't matter what (Harris) did, there was still opportunities for us...,'' he said. Winnipeg also got TDs off a quarterback sneak by backup Dan LeFevour, while Adams caught a 25-yarder just inside the goal line after an Edmonton turnover. Medlock added field goals from 21, 24 and 15 yards and was good on three converts. Kenny Stafford hauled in a 40-yard TD catch for the Eskimos and Duke Williams hung on to a 33-yard pass while falling backwards in the end zone. O'Neill missed a 40-yard field-goal attempt, but connected on one from 31 and made a pair of converts. How about that, it might not be that easy to beat the bombers back to back. Nichols is turning out to be a pretty good q.b. Riders might have to play bridge in those games. Along with glen. Unless jones trades him. Next... Riders have Edmonton and then back to back against the Bombers. Watching both of these teams tonight Riders will have to play Flawless ball like they did against BC. They can do it as proven in the 41-8 stomping of BC but they have to be at their best. 2 out of 3 would be just fine but 3 out of 3 would probably be a Miracle. Go Riders. 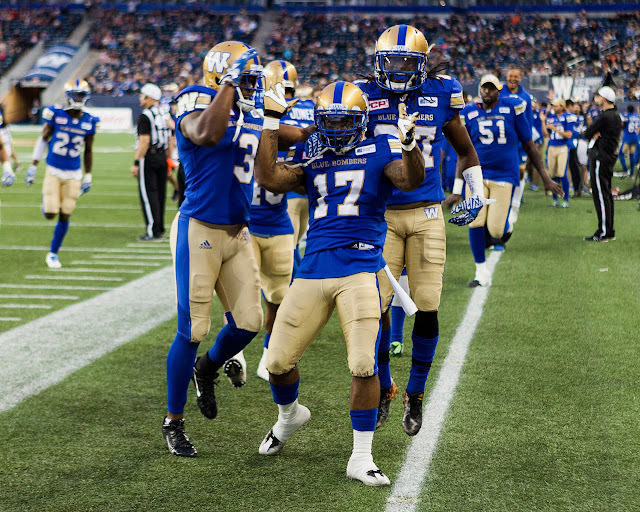 Bombers will humiliate the Riders in back to back beatdowns. Stupid Eskimos, cant wait 1 more week for the wheels to fall off, couldn't beat the Bombers to help the Riders stay close. Brutal. The Esk D was tackling like the riders D the past 3 yrs. So.....where are all the Eskimo trolls today??? pretty quiet on here. And the wheels have finally fallen off of the bus that is the Eskimos 2017 season! Look out E-Town! You are about to be invaded by riderville!!! What I see when I watch the 2017 Blue Bombers team. I see the makings of what could become a very solid and well oiled machine. It is the 3rd year of the latest Regime in Winnipeg. Last year at this point many in Manitoba had run out of Patience (just like here) and they were calling for Mike O'Shea's dismissal. Yet everyone could see there was a good team there except the play of the QB was holding them back. O'Shea's loyalty to Willy was going to get himself fired. So when Paul LaPolice sat Drew Willy and played Matt Nichols we all witnessed the same team achieving 1st downs. As well as having really good and consistant long drives that were ending with points. Nichols certainly executed the offence under the guidance of Paul LaPolice so much better than Drew Willy ever did. I had heard from Bomber fans that after the first 2 games that Nichols played and looked great and had won both of them. That Drew Willy's confidence as a Bomber was then shattered. Apparently there was word out of Bomber practise that Drew Willy could no longer look into the eyes of the players on offence while in the huddle. It is so clear that making the switch to Nichols was the right idea. As well as trading Drew to Toronto was brilliant. Drew was no longer a Confident Bombers QB and his way over paid contract of $400K was a joke. Especially since Willy had proved nothing the previous 2 years. Many think that trade was the beginning of the demise of Barker in Toronto and the beginning of OSheas renewed life in Winnipeg. I believe we can all see that the a Bombers have become a very good team. The players seem to believe in each other and that is most important. It also shows many of us that when a new regime takes over. It takes a couple years to get things going consistantly in the right direction. Meaning very competitive and a team that can dig deep to win the game in the 4th Qtr. The Bombers are now looking like a serious contender. Plus they have done this without Weston Dressler. His back up stepped in and has done an incredible job. I sure hope we start to see a Rider team that believes in each other and start to find the success the Bombers are presently enjoying. Amazing that they went undefeated ad long as they did with numerous injuries to key personnel. That speaks well to their scouting and coaching. One loss & the wheels have fallen off?? 3-4 & Riders are world beaters? Nothing wrong with that logic. Be afraid, be very afraid Bombers & Esks. Riders are coming to get y'all! #1. The Evil Empire is beatable. We play them next week and they are beatable. #3. There were a lot of empty seats in Winnipeg. How 'Winnepigish'. First things first - beat the Esks next week. Not likely. Probably split the games but to be humiliated? Doubtful! Not an Esk fan but losing one game is hardly the wheels falling off. Losing 3 or 4 in a row? Possibly. I agree, but the Riders just need to win as many games as they can regardless of who beats who. Then if we win enough we shall see where we end up. The Riders are à good team. Perhaps better than their record shows. They are moving in the right direction and the players just need to gain confidence and trust in one another. Winning is contagious as much as losing can be. These guys haven't hung their heads because they can see it. Hamilton's team to me looks like a team that has lost confidence and trust. They got in a hole they can't get out of. My Eskies lost big deal...people are making Winnipeg sound way above what they are though,don't get me wrong they are good but when you are 95% healthy playing against a 50% if that healthy squad proves what in general. They won this game but when healthy can they do the same...I would be willing to bet anyone on it.